3. weirdest platter. yes, the platter is adorned with fish bones. i don’t know why, but i love it! the contest rules required that the recipe be a salad + tomatoes be ‘the star’ of the dish. 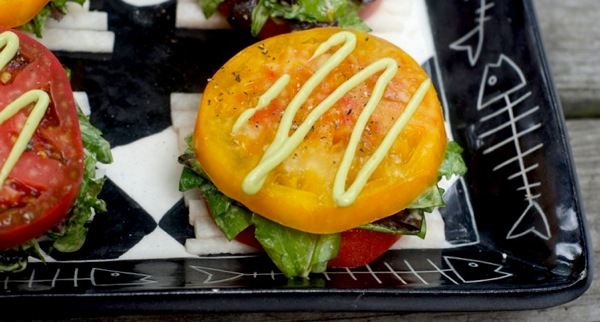 i decided on tomato + jicama stacks with mixed greens tossed with an avocado-lime cream. 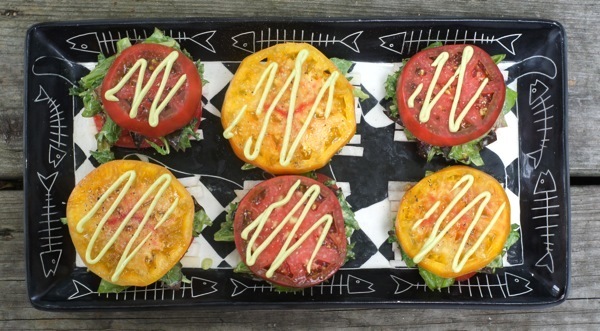 i used three types of tomatoes – red bradley tomatoes, yellow pineapple tomatoes + purple cherokee tomatoes, which each have subtle flavor differences. the sweet brightness of the tomatoes combines wonderfully with the crunch of the jicama, the pepperiness of the greens, + the zesty, buttery avocado-lime cream. even though i didn’t win, i thought it was a delicious + beautifully colorful dish. + get ready, because next year i *will* be winning that tomato recipe contest! makes 6-8 servings, a fearless homemaker original recipe! combine avocado, sour cream, lime juice + salt in a food processor. process until smooth + set aside. roughly chop the mixed greens, then toss with just enough avocado-lime cream to lightly coat. arrange stacks: start with 8-10 jicama sticks in a single layer. top jicama with one tomato slice, then 1/8 of the greens, then add one more tomato slice. repeat until all stacks are made. top with a tiny pinch of salt, freshly cracked black pepper to taste, + a drizzle of avocado-lime cream. Oh my goodness that does look pretty! It almost reminds me of caprese. But the flavor profile of jicama with tomatoes, sour cream & avocado sounds delish. And that avocado-lime cream will be used immediately in my house. How good would that taste in fish tacos? As a salad dressing? Dip for crab cakes? On a slider? With tequila-lime chicken? Mmmm the possibilities…. With all due respect, the Tomato Art Fest is carazay. This is a winner, doll! you had me at tequila-lime chicken (one of my favorite dishes). + the other options you suggested for using it tell me that you need to start an entirely food blog, ASAP. seriously, you have an amazing grasp of flavor combinations! Yum! These look so pretty! I am definitely going to be making some avocado-lime cream! the avocado-lime cream is delicious! definitely my favorite part of the dish. This looks SO GOOD…love jicama! I think these would be great for these hot summer nights we’re having in Texas. BTW…I’m hosting a recipe contest on my blog, and I really hope you’ll enter. Details on my blog…or you can e-mail me for specifics! Girl, you’re killing me! It’s fantastic! I must have this avocado-lime cream. Yum. it’s a lesley-suitable vegetarian dish, free of bacon, the truffle of the south! the avocado-lime cream is just delicious. mmmm. they look both beautiful & delicious to me!! thanks so much, heather! you’ll have to participate in the contest next year — it was a ton of fun! how pretty ! they look so yummy as well. thank you for sharing this. Beautiful! I wish all my bloggy buddies could have won! i wish we could have, too! i will say, we had a lot of fun connecting + chatting because of the contest, so it really did bring us together. cheesy, but true! GORGEOUS! Headed to the farmer’s market this weekend for fresh tomatoes…our gardens here in the midwest have suffered this summer so I haven’t been able to get them from my dad as I usually do. I’ll be anxious to give these a try! I love all these tomatoes! isn’t tomato season the best? i’m eating ’em morning, noon, + night! Oh these are way too fun and would be perfect at a party! the avocado cream is my favorite part of the dish. mmm mmm delicious!